These Sweet Asian Black Bean Noodles are egg-free, dairy-free, nut-free, soy free, and gluten-free so guests and all in the family can safely enjoy. With a little pre-planning and prepping, this Asian inspired fusion dish can be on the table ready for celebrating the coming New Year in style! An Asian inspired fusion dish that is egg-free, dairy-free, nut-free, soy free, and gluten-free! Enjoy as a New Year celebratory dish or add it to your family’s regular menu rotation of family dishes! Soak the dry Shiitake mushrooms in a bowl of ‘just boiled’ hot water, for at least 20 minutes or until the mushrooms are rehydrated and soft enough to be cut up (see Shiitake Mushrooms for more detailed tips on using dry Shiitake mushrooms). Soak the dry Shiitake mushrooms with the stems facing down into the water. Then dice the mushrooms finely and set aside. Alternatively, use fresh Shiitake mushrooms (see recipe notes). Meanwhile, soak the dates in ‘just boiled’ hot water for about 10 minutes. When the dates are softened, remove them from the water, peel away any large pieces of skin from the dates, then mince and mash up the dates into a fine puree. If the dates are not soft enough for mincing and mashing, soak them longer in hot water first. Alternatively, you can transfer the softened dates to a food processor to blend into a purée. While the dates and mushrooms are soaking, cut and prepare the ginger, garlic, carrots, tomatoes and cabbage. Use a large-holed cheese grater to grate the carrots and cabbage. If using canned black beans, drain and rinse the black beans well and then set aside to be used later. Otherwise, measure out the amount of cooked black beans to be used in this recipe. Follow the package directions to prepare the rice noodles. The following are the instructions on the product package I bought: “Bring a large pot of water on the stove to boiling. Once boiling, remove the pot from the heat. Add in one bundle of rice noodles into the pot and let these rice noodles soak for 5-6 minutes, stirring occasionally.” After these 5-6 minutes, I drained the tender but firm rice noodles and placed them in a colander. I then rinsed the noodles with cold water, drained them and set the noodles aside in a bowl for later use. Heat one tablespoon of oil in a large saucepan or wok on a medium heat setting. Add the garlic, ginger and diced mushrooms. Sauté for 3-5 minutes, stirring frequently, until the ginger pieces are golden and the mushrooms are slightly browned and release a strong fragrance. Add the remaining half tablespoon of oil to the pan and then add in the grated carrots, grated cabbage, diced tomatoes and drained black beans. Add salt and pepper, then stir until well combined. Let cook, stirring occasionally, for 5 minutes. While the bean mixture is cooking, prepare the noodle sauce using the well mashed dates, ketchup, maple syrup (or honey or agave nectar) and plant-based milk. Mix until well combined, then taste and adjust seasonings as desired (for example, if you would like the sauce a little sweeter, add ½ – 1 teaspoon more maple syrup, honey or agave nectar). After the 5 minutes, add the noodle sauce to the pot contents, then stir well to combine. Let cook for another 2 minutes, before adding in the cooked rice noodles. Combine the noodles into the bean mixture well, stirring frequently for 2-3 minutes until heated through. Add a tablespoon or two more fortified plant-based milk if the noodle mixture is looking very dry. Taste and adjust seasonings as desired. Ready to serve! Instead of dry shiitake mushrooms, you can use 4-5 large fresh shiitake mushrooms (rinsed, then diced finely) in this recipe instead. For added color and nutrition, you can choose to add in 3-4 tablespoons of dry red goji berries (rinse these berries in cold water first, then soak in warm water for about 5 minutes before adding to the stir-fry along with the grated carrots and cabbage). Instead of Medjool dates, you can substitute with a cup of dried Asian red dates [65 grams dry weight]. Rinse these dried red dates first in cold water, then place them in a small pot with approximately 4 cups of water. Bring the pot contents to a boil on the stove and then let the pot contents gently boil for 10 – 15 minutes, until the red dates are fully softened. Then scoop out the dates using a slotted spoon into a small bowl. Rinse these dates under cold water to cool them quickly, then peel away the outer skin of each red date before dicing and mashing the inner flesh up to be used as part of the noodle sauce. Make sure to add the rice noodles at the very end of the cooking process, and not to over stir to combine the noodles with the sauce when mixing the two together, as the rice noodles can break up easily if they become over cooked. Also if you like, you can add more cooked rice noodles to the dish at the end when tossing the ingredients altogether. I was able to add in an extra 70 grams (dry weight) of rice noodles and just added a pinch of additional salt and pepper to the noodles before mixing it all up together. In my experience, I have found that some date varieties like the Deglet Noor dates remain rather firm even after soaking in hot water for 10 minutes. I generally buy a large quantity of dried dates from the bulk containers at the grocery store, as I find it less expensive to buy these dates, though the date variety is not specified. However, they work well as these store bought dates do soften up enough after being soaked in hot water. So if you do not want to use Medjool dates in this recipe, use red dates (see Recipe Notes) or just look for a variety of dates that do soften up adequately to be used after soaking in hot water for 10 minutes. This dish is now a firm part of our yearly family’s New Year celebration. I hope you will be able to try it and enjoy it too. Happy New Year! 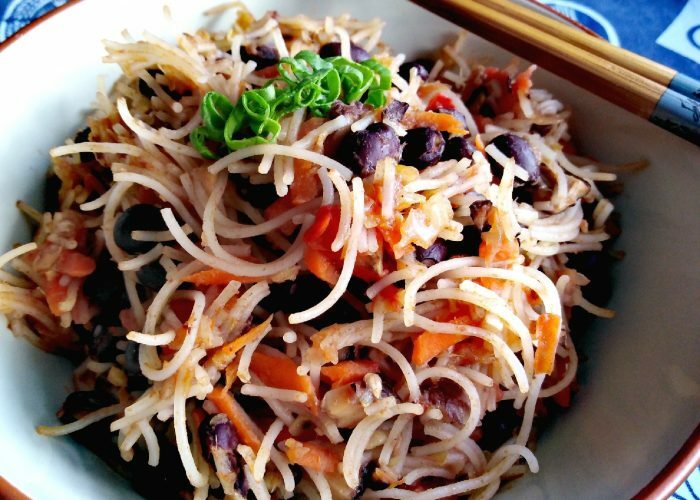 Looks super delicious, rice noodles and beans is a great combination.Hope you have a wonderful New Year celebration !